Improve a customer’s retail experience. Amputees undergo massive change in their lives. In addition to potential physical pain, they often face loss of independence, impact to self identity, and social stigma or rejection. Cosmetic covers have been shown to alleviate anxiety and promote increased agency over their limb; however, cosmetic covers are not often prescribed and amputees are left to identify and navigate virtual options on their own. We partnered with a local prosthetics company, Procare Prosthetics & Orthotics, to design an online marketplace that consolidates prosthetic covers of various durabilities, prices, and aesthetics. Additionally, we introduced methods to virtually “try-on” covers to provide greater understanding of the end-product and instill hope earlier in the amputation process. Each year, approximately 185,000 people in the United States suffer limb amputations. This number is projected to rise with the increased prevalence of dysvascular conditions, resulting in an estimated 3.6 million amputees by 2050. While the majority of lower-limb amputees opt for the use of a prosthetic, 84 percent of patients felt they lacked choice in the prescription of their initial artificial limb. Given their lack of participation in the acquisition of their device, one method for increasing ownership is altering the appearance of their limb to suit their personal goals and style through prosthetic covers. Until recently, there has been a significant gap in the market for aesthetically pleasing prosthetic covers. However, companies including Alleles, UNYQ, and Arthesis have leveraged advanced technologies to fill this need. While an important development from the amputee community, few of these companies allow direct purchasing, instead requiring the intervention of a prosthetist. To gain more insight into the user experience of cosmetic cover selection, we contacted UNYQ, an established maker of premium custom covers. UNYQ produces customized cosmetic covers in a broad range of styles, marketing their products as fashionable accessories to their users. 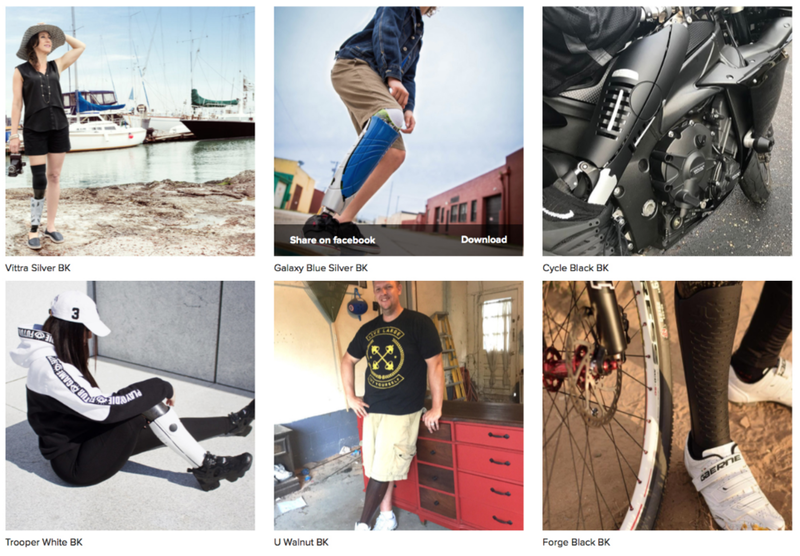 UNYQ features a broad catalogue of styles ranging from floral to industrial, a lookbook showing their users as models in lifestyle photo shoots, and features a blog full of testimonials from their customers. These customer testimonials reinforce the perceived benefit of the products UNYQ is offering, emphasizing the benefit of allowing amputees to control the aesthetics of their prosthetics. In our phone interview with a team at UNYQ, they highlighted stories of transforming individuals’ perceptions by giving them control over the appearance of their prosthetic. However, UNYQ struggles with sales. Challenges emerge on their site when looking to gain more information about a particular model and placing orders. In the former, clicking on a cover’s image simply provides a zoomed-in view providing no additional details. In the latter, you are redirected to a contact form where a UNYQ representatives walks you through the acquisition process. We questioned UNYQ about this purchasing approach during our interviews, and discovered that they had removed a web-facing storefront that they had previously developed due to the challenge in recording accurate measurements and specifications through an online order and concerns that they were receiving from their prosthetist clients. Given this tension in the market, balancing direct sales to customers and those through a prosthetist, we decided to understand the acquisition process from one of UNQY’s listed suppliers, ProCare Prosthetics & Orthotics. To better understand the business model of a prosthetist, we met with two staffers of ProCare Prosthetics & Orthotics. While the ProCare team stated that they were supportive of UNYQ’s vision, they mentioned that their products were not sold in great volume at their office. They cited lack of interest as the primary reason for low sales, but stated that price was the dominant consideration throughout the prosthetic acquisition process; while compliant with insurance coding practices, prosthetic covers are seen as an added expense to the product.